The Prairie Band Potawatomi Early Childhood Education Center is committed to providing quality services, which assure a seamless system of care and education for children, families, staff and the community. A child can best benefit from a comprehensive interdisciplinary program. The overall learning experiences of the child are considered with the entire family and community interlinked as partners in his/her progress. The child’s language and culture are respected and reflected in the learning environment and interactions. Parents are recognized as the child’s most important teachers and contributors to his/her growth and development. What began in 1982 as a grassroots effort by some Prairie Band Potawatomi tribal members has turned into one of the most successful Native American Child Care Education programs in the country. 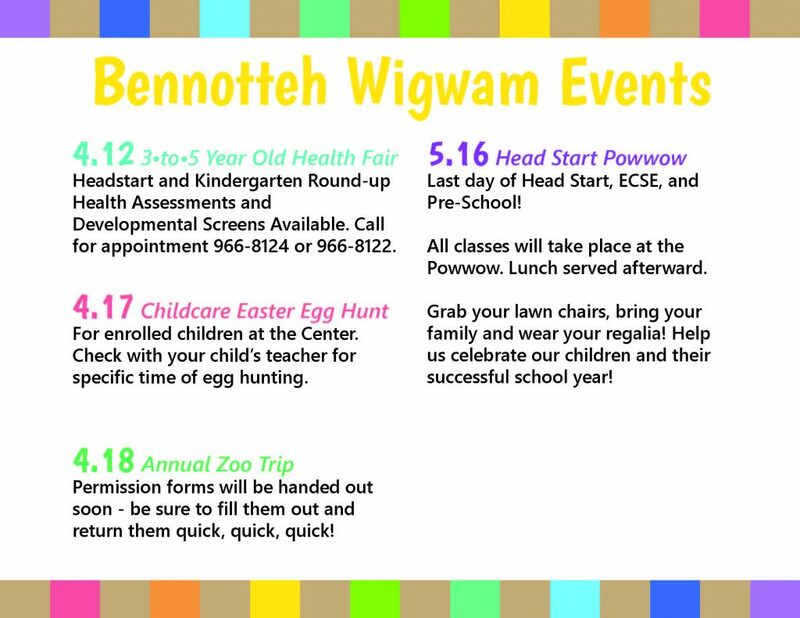 Ben-no-tteh Wigwam (House of the Child) has been recognized for its high quality programs in child care and Head Start. It was selected as one of seven Native American programs in the United States to receive the prestigious Brazelton Touchpoints grants awarded in 2002, and continues to receive a yearly training gift from Brazelton Touchpoints Center to ensure continued efforts and standard. In 2013 and 2014, managers were selected for the competitive Brazelton Touchpoints Center American Indian Early Childhood Community Leadership program. And, in 2015 the Center was honored to be directed by the National Head Start Association Administrator of the Year. What makes the center stand out is that it not only provides a needed service for the Potawatomi community but it does so by integrating Potawatomi culture. 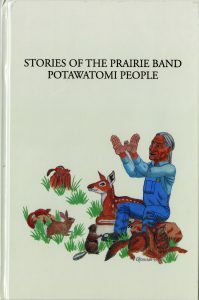 The teachers and staff practice the Potawatomi language daily and the Language Department visits the classrooms once a week for extra lessons, songs, and stories. The Center also incorporates both Potawatomi and English signage in the classrooms. Additionally, the Center has been known to offer after-hours classes in traditional Potawatomi skills such as moccasin making. 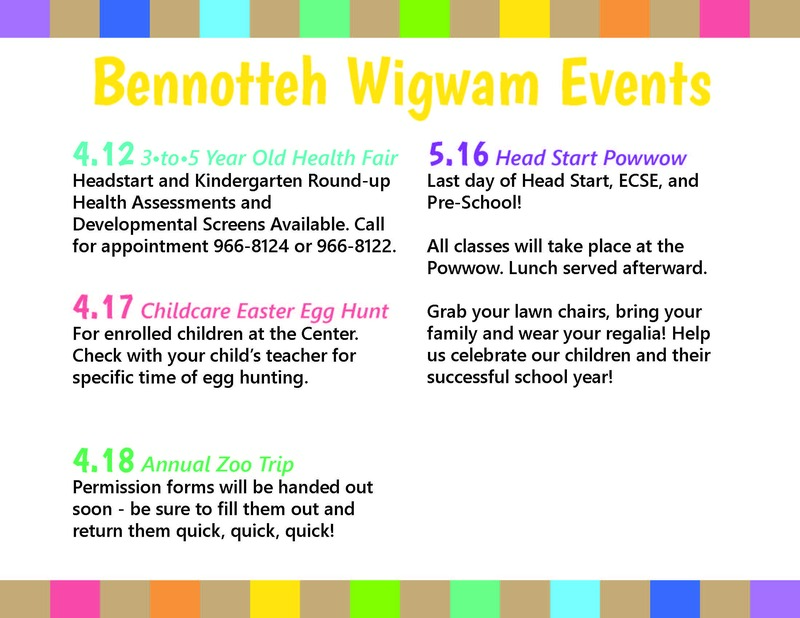 Lastly, Ben-no-tteh Wigwam gives a ribbon shirt or shawl to each child during the annual end-of-year powwow celebration. The surrounding community has also been actively involved with the Ben-no-tteh Wigwam. Collaborative efforts with Royal Valley USD #337 and health providers like the Prairie Band Potawatomi Interagency Coordinating Council/Health Advisory Committee give the Center credibility and prestige and also help the local school and health organizations serve the Native American population. Kansas University also implements its Culturally Responsive Early Literacy Instruction (CRELI) program through a partnership with Ben-no-tteh Wigwam. CRELI provides master’s degree training to Native Americans, or those preparing to work in Native American communities, in the field of Speech and Language Pathology. Through the continual utilization of Native American traditions combined with programs in education, the well-being of each child is realized. The long-term commitment that the PBPN is showing through the Early Childhood Education Center should lead to serving future generations for years to come and making for productive and healthy tribal people. Prairie Band Potawatomi Head Start Policy Council is mandated to establish and maintain a formal structure of shared governance through which parents can participate in policy-making or in other decisions about the program. The Policy Council is comprised of parents and community representatives and meets once a month. The Tribal Council is invited to each meeting. “Head Start encourages the role of parents as their child’s first and most important teachers. Programs build relationships with families that support positive parent-child relationships, family well-being, and connections to peers and community” (ECLKC, 2016). Policy Council’s primary goal on a federal level is to ensure that local programs are meeting parent participation goals set forth by the Administration of Children & Families. On the local level, Policy Council assists Head Start administrators with programming designed to meet the needs of children and families enrolled in the program. Head Start Performance Standard 1301.3 provides the mandates under which Policy Council must operate. Policy Council has a number of duties that are explicit in the Head Start Act. For example, they must participate in the determining of all Head Start and Early Head Start staff. They must also approve the budget and grant application for the program. A key role they play is helping determine the enrollment of Head Start and Early Head Start children and families. First, they review and, if necessary, edit the Point Criteria system utilized by the program to determine enrollment priority. They receive anonymous Point Criteria forms to ensure that points are dispersed accordingly and, finally, approve the pending list. Another function of Policy Council is to help complete the self-assessment and the community assessment. They also help set the yearly goals of the program though data obtained through the assessment processes; as well as through other data provided through the year by the Management Team. Data measures classroom effectiveness, child learning outcomes, health and safety, and a wide array of other program components such as curriculum and child attendance rates. Head Start has a 5 member council: a Chair, Vice-Chair, Secretary, and two members. Current members include Michelle Simon, Jayme Mitchell, Elizabeth Wabaunsee-Tye and Tara Mitchell. ICC is a group of professionals, community members, and parents coming together to help guarantee services to children and families. They help ensure best-practice, as well as guarantee that community programs are not redundant in nature. For example, they may provide current information and guidance on medical policies, environmental hazards, and community resources. The group meets once a quarter and each agency brings their own topics to discuss. ICC is required by Part C, Head Start and Early Head Start, and Child Care. The membership is non-exact and attendance is not required but definitely beneficial to guarantee a seamless approach for children and families. Current agencies that are invited to attend are Royal Valley, various Prairie Band Potawatomi Nation departments, Jackson County Health Department, Parents as Teachers, KanCare representatives, Indian Health Services, and PBPN Health & Wellness Center representation. If you would like to join the ICC meeting, please contact Nikki Jackson, Child Care Specialist at NikkiJackson@pbpnation.org to be added to the listserv. The Parent Committee is comprised of all 44 Head Start and Early Head Start families. Their primary function is to elect a Policy Council and assist Policy Council with making decision that guide the program. Essentially, they are the constituents while Policy Council are the Representatives. The Parent Committee also volunteer for events and activities in the Center to ensure in-kind and parent engagement requirements are met. If you would like the Parent Committee to know about an issue, please contact the Policy Council and they can inform the Parent Committee. The Parent Committee does not have bylaws.